Burrata is one of the signature cheeses at Pizza 4P's. 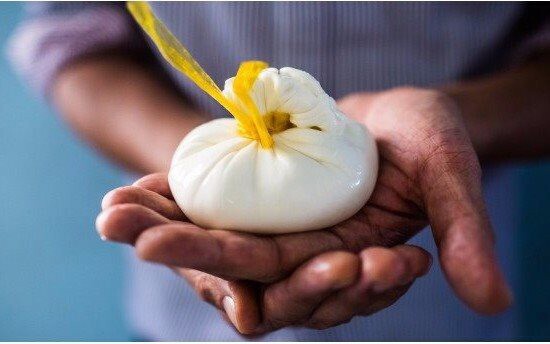 The outside thin shell is a curd of mozzarella while the inside contains a mixture of curd and fresh cream. As Burrata means "buttery" in Italian, it has mild and creamy flavor. Burrata was originally produced in Puglia, a region in Southern Italy. 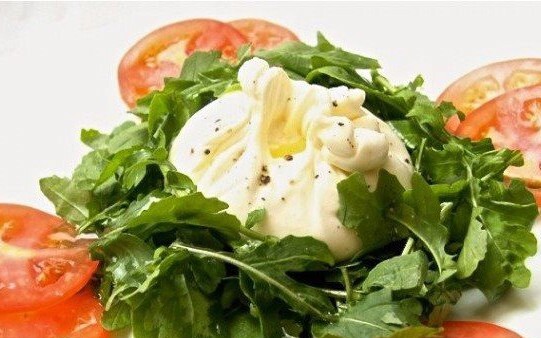 Burrata's outer shell is a curd of mozzarella while the inside contains a mixture of curd and fresh cream. As it has an extremely short expiration period because of the use of fresh cream, it is known to be very difficult to get even in Italy. Lightly mix rocket with extra virgin olive oil and put all the ingredients on a plate. Sprinkle salt and pepper on a Burrata cheese and then drizzle balsamic vinaigrette over the salad. Expiration period: Perrishable. Please consume as soon as possible.